I'm in London – in fact, I'm sitting at a table in the basement of the Building Centre – with some great things lined up for the week. One event, in particular, though, seems worthy of mention here. This Friday, on the 4th of July, I will be moderating an all-day series of live interviews hosted at the Storefront for Art and Architecture's Pop Up London venue in the Exhibition Road, South Kensington, as part of the London Festival of Architecture. 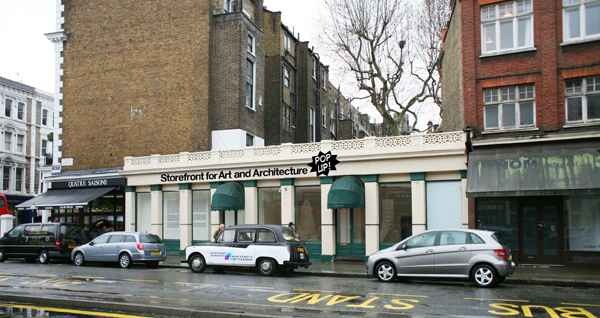 [Image: The Storefront for Art and Architecture's Pop Up space in London]. I'm unbelievably excited about this, in fact, not least because I will finally be meeting in person so many people with whom I've long been in email contact – but also because I can hardly think of a better list of people with whom I'd rather spend the day here in London. The interviews are live, free, and open to the public – but bear in mind that the space is quite small, and BIG's models are, yes, quite big, and so there will be very little room for a comfortable audience. We're thus downplaying the live nature of these discussions, but we are videotaping all of them for later posting on the Storefront's website. I also hope that these will be transcribed for later publication. I really can't wait, actually. So if you are in London, please feel free to stop by and introduce yourself, whether you're a reader of BLDGBLOG or not. You'll be able to ask your own questions of the interviewees – and, who knows, maybe even get them to autograph a book or two. And I hope to be posting at an acceptable pace this week, as well. Finally, here is a map. Ha! I could immediately tell it was London because of the rain! A great line-up of interviewees. I wish I could be there. I hope there's a way of catching up later. I wish I could be there! Good luck postopolising on your own. haha at the rain comment: didn't the black cab give you a clue too? i hope to catch this; it looks great. Arrgh, I can't make Friday. Had I known about the exhibition I'd have stuck my head in when I walked under the place last week (on my way to the Natural History Museum round the corner). I recommend the little sandwich shop it's practically next to, if you get hungry. Clare, too bad we'll miss each other this week, but maybe next time. I'll try to get back to the UK this autumn. And if any BLDGBLOG readers do stop by today, feel free to introduce yourselves. It'd be nice to meet.